The boys in Buckley’s Upper School are leaders. They lead younger boys by example, they take on the challenge of increasingly complex and demanding academic work, they excel in the arts, they lead student activities, they represent the School in interscholastic athletics, and they serve their community. They embody what it means to be a “Buckley boy” as they prepare to bring their fine talents and strong values with them to secondary school. The Upper School is dynamic and demanding, with a commitment to pursuing excellence and to helping boys find joy in learning. Starting in Class VII, in addition to his continued study of history, English, mathematics, and science, every boy begins the study of Latin. The Upper School operates fully within departments, and every teacher is an expert in his or her discipline. Boys who have studied French or Spanish in the Middle School continue on with their study of that language, while students still developing their writing and study skills enroll in our Skills and Language Arts class. In the Upper School every boy develops advanced skills in every discipline—skills that will serve him well for the rigors of his next school and for a lifetime of learning. Our beautiful new science classrooms offer our boys the opportunity to learn biology, chemistry, and physics through hands-on lab activities. They study algebra at an advanced level often reserved for high-school students. They pursue research projects in their study of history. They read great works of American and British literature and learn to write clear, compelling prose and evocative poetry. They learn foreign languages—both modern and ancient—that help them see their world and their native language in a more sophisticated way. They write code and engineer complex structures and machines. The boys also assume leadership in the arts. All Upper School boys sing each week as members of the Glee Club, in addition to their music classes, while some boys audition for our more selective singing groups, Varsity Singers and the Veritones. In their art classes, the boys paint and create pieces that hang throughout the school. In Crafts they carve a personal plaque that will take a place on our walls and will serve as each student’s visible legacy at Buckley. As members of the Student Council, editors of student publications, captains of sports teams, and heads of community service, Upper School boys commit much of their time and energy to serving their school and their community. The Upper School also offers boys opportunities to pursue interests beyond the curriculum through our varied and lively Clubs program. Through Clubs in the past boys have chosen to learn about microfinance, to build Lego “Great Ball Contraptions,” to enhance their knowledge of Roman history, to play “Ping Pong with Power and Panache,” to expand their understanding of the Middle East, and to develop their skills as creative writers (to name just a few!). With high expectations of our boys comes much support as well. In addition to his homeroom teacher, every boy has an advisor to guide him through his time in the Upper School. Our advisory groups are never larger than four students, ensuring that the bond between student and advisor is strong and that every boy feels truly known. To help foster regular dialogue between students and academic teachers, a study hall period is built in to the schedule so that the boys can meet with their teachers—or simply get a headstart on their homework! Buckley’s Upper School is full of energy, for every boy participates fully in the life of the School in a visible and substantial way. We take pride in our boys and their growth during these essential years, and we celebrate the young men they are becoming. Pete Simpson, the Director of Buckley’s Upper School, is a graduate of the all-boys Roxbury Latin School in West Roxbury, MA. He holds a B.A. in Sociology from Dartmouth College and an M.A. in Private School Leadership from Columbia University's Teachers College. Pete spent the past six years as Assistant Director at the Klingenstein Center for Independent School Leadership at Columbia University's Teachers College. In this role, Pete oversaw graduate student consultancies in New York City independent schools, stayed abreast of current developments in teaching, learning, and cultural competency in order to improve programming, and oversaw the office staff and the recruitment, admission, and evaluation of hundreds of independent school educators, including several of us here at Buckley, each year. Prior to his time at Klingenstein, Pete was the Middle School Co-Lead Teacher at the Journeys School of the Teton Science Schools in Jackson Hole, WY, and a teacher at the Park School in Brookline, MA. Last spring, our science teachers and students planted a few seeds on the fourth floor balcony of the Arts & Sciences Building. They returned this fall to find a full learning garden in bloom! 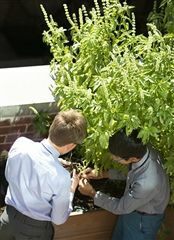 Upper School boys now have the opportunity to garden during club period, and Nick Frankfurt, our Science Department Chair, will be using the garden in his life sciences curriculum.